DE PERE, Wis. (CNS) — Harry Boyte sees democracy in crisis, but he’s hopeful that’s about to change. He finds that American society and societies around the world are undergoing “an unraveling of the civic fabric” highlighted by acrimony and prejudice, a world in which people with differing opinions cannot converse, where places where those conversations might be held are disappearing. However, “we are at the threshold of another stage around civic engagement,” said the founder of an institute for the development of citizen-driven democracy and an acclaimed civic education/empowerment initiative for young people, he said. His optimism is buoyed by actions such as the student-led protests to ban assault weapons following the shooting massacre at the high school in Parkland, Florida, that left 17 people dead. 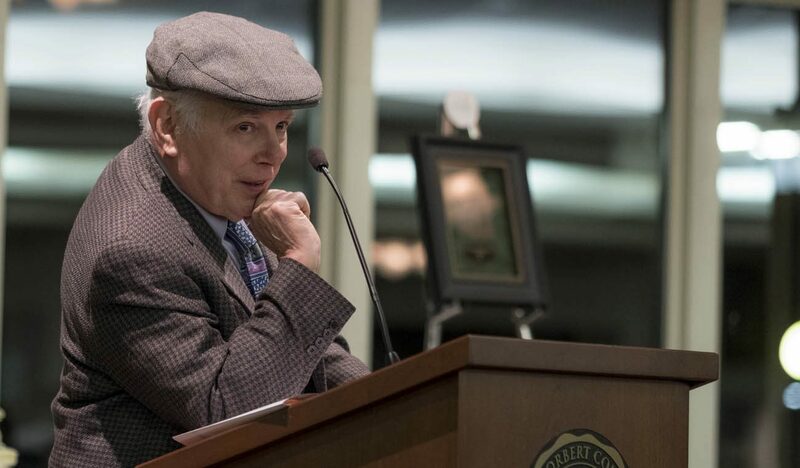 Boyte, 72, was on the De Pere campus Feb. 23 to receive the St. Norbert Ambassador of Peace Award, given annually to an individual who has been an influential advocate for sustainable peace. Like the school namesake Norbert of Xanten, the award winner is someone who advocates and demonstrates respect for persons, promotion of dialogue, nonviolent conflict resolution, reconciliation and forgiveness. St. Norbert’s president, Brian J. Bruess, presented the award to Boyte. In 1990, he introduced a program called public achievement at St. Bernard, an inner-city Catholic elementary school in St. Paul, Minnesota. With coaching from University of Minnesota students, St. Bernard grade schoolers formed teams to work on projects of their choosing, identified obstacles, contacted civic and community leaders to gather support and brought their projects to those in power. The students’ effectiveness in getting a zoning change so an empty lot could be turned into a playground, among other successes, was among the reasons that Public Achievement has spread — not just in the United States, but to 33 countries. It is part of teacher-education programs at a dozen colleges. Democracy is the work of people and institutions, something all have a responsibility for, he said, and it is deeply connected with Catholic social teaching, which he learned during key experiences working with the College of St. Catherine in St. Paul and St. Bernard Grade School there. He spoke at length about “public work,” which he explained is an activity that benefits more than one’s self, that has a benefit to one’s community. Boyte pointed out that the concepts of public achievement aren’t just for young people and not just for schools. City governments are using the Public Achievement model to address civic challenges. The program’s tools have been adapted for use in social work, and there’s now a group in a prison using Public Achievement to work on issues surrounding domestic violence. Boyte used the term “public love,” which has nothing to do with sexuality but is the acknowledgement that all people have some value. “You don’t have to like people — you can even dislike them — but you can still believe they have the capacity to contribute to the human condition,” he said. He echoed Francis, encouraging people to become, in the pope’s words, “artisans of the common good,” “to build a ‘we,’ not simply an ‘I,'” Boyte said. Zyskowski writes for The Compass, newspaper of the Diocese of Green Bay.